Henry Williams Love Foundation (HWLF) is super proud to again partner with Safe and Sound on their Arts and Activism Scholarship Program in Chicago. The scholarships from HWLF will support students who have suffered the loss of a parent or are connected to the foster care system. The kickoff and launch of the scholarship application process will be on Friday, 2/22/19, from 6pm to 9pm at the Oakwood Shores Clubhouse (3825 S. Vincennes in Chicago) in conjunction with the Safe and Sound-Celebration of Blackness Poetry Cafe. Please spread the word so students, parents, educators, caseworkers and others can attend the event and ask questions about the scholarship process. If you are interested in donating toward the scholarship, please click the donations link above. In an effort to be more resourceful for students not only applying for the Arts and Activism Scholarship, but anyone who is applying for a scholarship, fellowships or process that requires an application, HWLF has created the “5 Tips on Becoming a More Successful Scholarship Applicant.” The helpful and encouraging tips shared in this video are applicable to anyone applying for a scholarship regardless of age. For more info about the Arts and Activism scholarship, visit http://www.safeandsoundconnect.org. And for more info on all the great program and services provided by HWLF, please visit http://www.henrywilliamslove.org. Happy New Year! We are so thankful for every experience last year, ever person we helped, every partner we made, and everyone who helped support this organization. 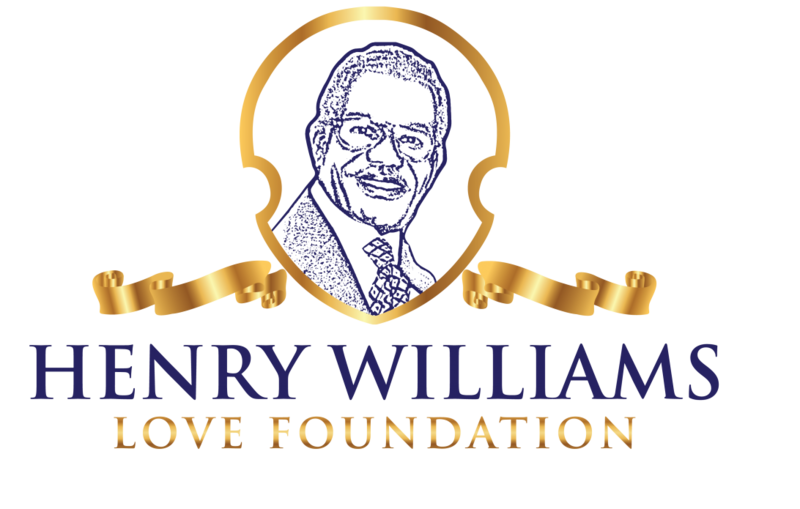 It is so important that Henry Williams Love Foundation stays true to its mission. And although we have the heart to help many, we want to ensure that our community-based, non-duplicative, gap filling philosophy of small acts of service is maintained. An online annual report for 2018, will be published on 2/1/18. Again, THANK YOU! On to 2019! Henry Williams Love Foundation is happy to report our first partnership with the Chicago Public Library-Teen Services Department. We will be launching, Modge Podge Poetry, under our Arts Appreciation focus. Modge Podge Poetry is a makers workshop that guides teens on a personal literary journey that will manifest itself into a poem on canvas. The purpose of Modge Podge Poetry is to empower, provide introspection and creative expression, along with future goal forecasting all wrapped into an art project that teens can take home with them and serve as a reminder of their ambitions. Additionally, Modge Podge Poetry will be an all-day interactive activity available for attendees of the 4th Annual ChiTeen Lit Fest on Saturday, April 27th, 2019 at Columbia College Chicago. The ChiTeen Lit Fest (CTLF) is a for-teens-by-teens event that provides a safe and creative space for young adults to unlock and discover their unique voices through the literary arts. CTLF brings together young people from across Chicago to celebrate their talents as they express themselves through exceptional and honest art. This event is open to teens ages 13-19. If you are interested in Modge Podge Poetry coming to your library, school, community center, church, or even corporate setting, please send us an email to info@henrywilliamslove.org and put “Modge Podge Poetry” in the subject line. This past Saturday, a few fathers collected their sons and nephews and came to the south suburbs to participate in Connected Through Hoops. The idea was to provide a safe space for fathers (elders) to spend time with their sons (youth) while playing basketball. The event was designed to try and strengthen the connection between men and their boys through significant physical activities. And I believe we did just that. With this being the inaugural Connected Through Hoops event, my mind was filled with solutions to problems that hadn’t occurred. I was anxious because I wanted the event to go well and I wanted this time that these families of men and young men would spend to help strengthen their relationships. When I reflect on the interactions I had with my son on Saturday, I can only hope that the others fathers felt the same closeness. Usually it’s hard to get my son away from his electronic devices. Shockingly, he didn’t pick up his phone or ask for it for the entire time we were there. As I think back, I don’t recall seeing any of the young gentlemen staring off into their phones. I was happy to see that everyone was engaged. I also saw my son be more outgoing when I am used to seeing him withdraw in large groups. I can’t help but think that my presence played a role in his confidence. I hope the young men there felt something meaningful directly related to the person that brought them there. I can only speak for me but I imagine that similar memories were created for the other families represented. I am grateful for Joseph Williams, one of the Co-Founder’s of the Henry Williams Love Foundation for being there to represent the foundation and for assisting with managing the event. The refreshments provided by the Foundation kept everyone hydrated and energized. I have already begun planning the next Connected Through Hoops event because I want to continue to provide opportunities for the relationships between fathers and sons to flourish. Please follow henrywilliamslove.org for more information and upcoming details for other Connected Through Hoops events. Guest Author Post by Board of Directors Member, James Tate, Jr.
My father introduced my brother and I to the game of basketball but it wasn’t until I was in 8th grade that I started to fall in love with the sport. Some might consider me a late bloomer. I was a student at Theodore Herzl Elementary School in the North Lawndale area and I remember dunking tennis balls and then volleyballs on the regulation rims. It’s possible some of my father’s athleticism trickled down to me. I have heard that he was a pretty good ball player. It turns out that athleticism was enough to earn a spot on Lane Tech High School’s basketball team, which eventually opened up an opportunity for me to play basketball on a collegiate level. This chronology changed the entire path of my life. My father would drive the two and a half hours to Madison Wisconsin to watch me play and then drive back to Chicago after the game. I’d like to think that he was proud of me. I’d like to think that he lived his hoop dreams through me. I realize that he was probably proud of me for more significant reasons like graduating high school and getting a college education because those experiences were not guaranteed for most of my peers but I’d like to think that our love for this sport connected us. While my experiences at Edgewood College gave me institutional education in academics and athletics, it is my personal experiences as a father to my own son (pictured below) that inspired me to create the Connected Through Hoops event. I wanted to give fathers and sons another opportunity to connect with each other and together build skills that can help them in their own lives. There are so many levels of connectivity and I believe the more levels we can connect on (as a community), then the stronger our bonds become; the stronger our communities can become. I am fortunate to sit on the Board of Directors for Henry Williams Love Foundation, who through my service and some board training, I am able to plan these types of events. Help me strengthen the community of fathers and sons on December 8th at the Richton Park Community Center between 5 and 7pm. Register to attend at http://bit.ly/connectedthroughhoops. I’ve experienced more loss in 2017 and 2018 than ever before in my life. First, my Father passed in May 2017. Then his Sister, my Aunt and only living sibling left of my father’s siblings, passed in July 2017. And all of that was happening while I had to lead Smart Chicago Collaborative through a merger which in many ways also felt like a loss. My Grandmother then passed in July 2018 and now my Mom on November 1st of this year. IT HAS BEEN TOUGH! But I am middle- child tough and have always tried to live a deeply-rooted life, full of good purpose. Even with sadness, I want to be helpful to as many people as I can. In The Secret Powers of Middle Children, Lynn Griffin, R.N., M.Ed shares on Psychology Today, how middle children are mistakenly labeled as undriven versus first-borns. She challenges that notion and believes middle-children are actually very driven and “more oriented to principles and concepts, like justice, over earning power or prestige.” I align with this frame of thought which has provided the framework for my entire life, inclusive of my career pathway. I am so grateful that I had fantastic parents, grandparents, aunts, uncles, and mentors who poured into me such love, and sometimes tough love, which I believe has made me a good leader. When determining what Henry Williams Love Foundation (HWLF) would be organizationally and how we would serve those communities that needed the most help, the Board of Directors wanted to instill a sense of love and gratitude in the provision of services. The hope is that our community co-designers and participants experience healing and build resilience by spreading love and gratitude in their own life’s journey while retaining knowledge which helps with skill building. When the storms of life come, and they will as evident by my first paragraph, people can still find something in their day to be grateful for and keep thriving. Don’t ever underestimate the power of gratitude in difficult times. It serves as an excellent motivator and I believe an answer to the critics who believe social programming decreases resiliency and fortitude. As I sort through the sadness and continue along this lifelong journey of gratitude, I know there are beautiful things coming along the path for HWLF, our partners, and participants. The Shuri Project has some expansion opportunities locally and internationally and we are trying to secure resources to realize that goal. We are launching the brother program to Shuri, The T’Challa Project, and currently, have a Go Fund Me Campaign in collaboration with #GivenTuesday that will assist with purchasing laptop computers to ensure we are ready for summer 2019. As we look to our other areas of focus, HWLF will introduce two new programs in December that we are really excited about and have a couple of promising ones that will be announced in January if funding is received. I am grateful for the many colleagues, collaborators, stakeholders, community-champions, participants and friends who consider the words that I share and work that I do here at HWLF valuable. Building a new organization in the land of non-profits and the current philanthropic environment is tough, but again…I’m middle-child tough. It is with deep sadness, the Henry Williams Love Foundation announces the passing of Ola Williams, wife of the organization’s namesake, Henry Williams. The memorial services will be held on Monday, November 12, 2018 at Sun River Terrace Community Center (SRTCC) located at 7219 E Chicago Street, Sun River Terrace, IL 60964. The memorial service starts at 11am and the repast will immediately follow. Ola’s favorite color was navy blue, so the family is asking that everyone in attendance wear something navy blue in her honor. Flowers will be accepted at SRTCC. In lieu of flowers, donations can be made directly to the Henry Williams Love Foundation by clicking the donate button on this website. Cards and other written condolences can be mailed to PO Box 703, Hazel Crest, IL 60429 for those unable to attend. Five years ago Silicon Valley tech companies were pressured to share their workforce demographics and revealed the industry is overwhelming white and male. None of this was a surprise to diversity advocates and equity champions. But the media inquiry helped to stir of diversity and inclusion conversations all over the world with plans put in place to “do better.” Leaders of tech companies penned blogs, adopted immediate policies, and pledged to devote resources for recruitment of more diverse staff members. The word “diversity” was added to mission and value statements and some larger companies even hired heads of diversity. Existing staff members were sent to unconscious bias training and the box was checked, done. But change has been really slow and the number of Black and Latino people in the tech workforce has actually declined. Diversity fatigue has set in and many early supporters have found themselves stuck and alone. If what has been prescribed as a “solution” to diversifying the tech industry is not working, what new approaches to diversity and inclusion exist and how can we build the tech sector we want? Those questions inspired great conversation during the Thoughtworks Tech Talks panel on Monday 10/30/18. President and CEO, Kyla Williams, along with CEO of Change Catalyst, Melinda Epler, participated on this panel that was moderated by Tarsha McCormick, Head of Diversity and Inclusion for ThoughtWorks. Kyla added that before data is consulted and plans are made, a crucial step in organizing and establishing workplace norms around diversity and inclusion begins with the individual. She believes self-inventory to determine the internal value of diversity, privileges, as well as apathy and exhaustion around diversity and inclusion conversations is a necessary step for organizational cultural shifts. Forced Diversity. What Does Inclusion Mean to You? To me, diversity means the attempt to include, and having respect for, different backgrounds, points of view, philosophies, cultures, races, genders, heritages, etc. as part of the organization’s team. What Does Diversity Mean to You? When HWLF made the decision to launch a tech mentoring program, it was through a value assessment of the Board members that supported launching The Shuri Project as a girls only program as shared during her talk with Chi Hack Night. Those values were further supported by data and even provided necessary information about failing efforts in diversity and inclusion efforts in the jobs sector that influenced the program and curriculum design plan for The Shuri Project. The panelist had much more to add on the topics of intersectionality, specific needs of excluded populations, more accelerations and incubators and education around them, venture capital, and other anecdotes. The entire panel discussion can be found on the ThoughtWorks YouTube channel in the coming days. For more information about The Shuri Project or to book Kyla Williams as a guest speaker, please email info@henrywilliamslove.org. On Friday, 10/19/18, The Shuri Project participated in the Black Girl Ventures Pitch Competition. Black Girl Ventures is the brain child of founder Shelly Bell. The completion was held at Google’s Chicago headquarters and the room was packed! The BGV Pitch Competition is a crowdfunding meets pitch competition. We charge a nominal admission fee for attendees, then the money raised is giving to the winner of the competition. Each founder has 3 minutes to pitch and a 3 minute Q&A from the audience. The audience votes and the winners are chosen. There will be a first and second place winner. The Shuri Project along with nine other business completed their pitches and took really good questions from the audience. At the completion, an electronic vote was taken among the eligible voting audience members and The Shuri Project scored second place. It was an exciting experience and we learned a lot, which will prepare HWLF for future pitching of the program. We are thankful for this opportunity and appreciate all of the encouragement and networking connections that were made. To learn more about The Shuri Project or to inquire about partnership, please contact President and CEO-Kyla Williams at kyla.williams@henrywilliamslove.org. There was lots of energy and good questions about The Shuri Project during Chi Hack Night on 9/18/18. Soren Spicknall captured the highlights of the presentation perfectly on Twitter. There is no excuse for not having mentors whose lived experiences reflect students’ own lives, especially in a city as diverse as Chicago. To watch the full presentation, visit Chi Hack Night on YouTube.